If I were walkin’ in your shoes, I wouldn’t worry none | Separated by a common language. Fine, the monkey doesn’t really have anything to do with anything, but it’s a funny picture, so enjoy! Things are pretty stellar right now. I am going to Vancouver for a week in less than a week! This trip should be legendary! Steve R, me, Mike, and Dusan = shenannigans! I now get to look forward to my sweet freakin’ apartment with Steve V! So awesome. There will be a housewarming party for sure (once we get all of our furniture and crap together)! It’s going to be a summer full of fire pit parties! I also got the inside scoop that an organization I’m currently volunteering for is going to try and hire a summer student to do marketing, which is totally awesome! Hopefully I can get this position, because if I do, I have a good chance of becoming the Executive Director within 4 months! HOLY CRAP! Can you imagine?! LMizzle running a feminist film festival?! I’m all over that if it happens. I’ll probably poop my pants. I’m also enjoying some veggie hot dogs, which makes my day about 100% better because hot dogs are delicious. I also have the day off, which is also sweet. All in all, things are just lovely right now. 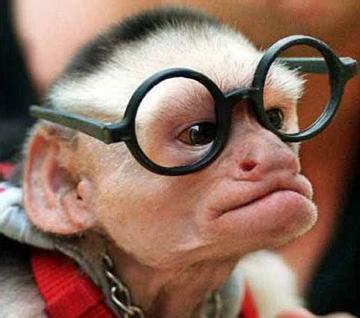 Glad to hear things are going so well – and the monkey looks like George Burns. Balls out Marts, balls out! Man. You can out on whatever you like if you become Director. Wear pants on your head as a fashion statement and see if it catches on. Commission ‘Predator: The Musical’ and I will gladly write it for you.